The entire web is made up of links that are pointing from one web page to another. The web is an ever changing entity and can be quite unpredictable too. There are new pages being added on a daily basis and also removed too. This process is continuous on the web but it causes an issue with regards to broken links. When a page is removed then the link pointing to that page no longer exists and therefore is regarded as the broken link. All webmasters must understand their responsibility in dealing with internal links, outbound links and broken links. These need to be taken care of on an on-going basis. The internal links of your site are the ones that join one web page to another within the same site. These are links built within your own website structure and are easier to deal with because the decision to remove pages is entirely on the company or organisation. Saying that broken links can be handled the same way too. We advise that it is imperative to make some time so that you understand the full architecture of the website. In doing so, you will make sure that there are no pages that still link out to a page that no longer exists. The Outbound links are links that point to a different web property for instance, blog post, forum post infographics etc. These links are much more difficult to manage because there is simply no control over the web content which is owned by a third party. A webmaster may decide to change the content on the page which deems the page as irrelevant as it is no longer a relevant link anymore. Another issue arises when a webmaster decides to remove the page completely, this results in a broken outbound link on your site. Did you know that broken links, whether they are internal or outbound have the ability to negatively impact the usability of a website which in turn will take a hit on all your SEO efforts. The search engine spiders will crawl your site and it will surely locate the broken links on the site. You can also see all your broken links on the Google webmaster tools account. These spiders will send a message in the form of errors on your Google webmasters tools account telling you of all the broken links and website errors they find on your website. When a search spider is not able to crawl your site properly then you will have little chance of your pages getting indexed quickly. Did you know that too many “404” errors can put a dampener on your SEO efforts because this will signal a poor user experience on your site which will decrease the overall value of the site. All major search engines give high rankings to web pages that offer a good quality user experience and the opposite can be said to sites that make a user frustrated. Low quality pages are determined by the bounce rate of the website. As an avid web surfer I detest websites where when I click on a certain link it is either dead or sends an error page. It affects my user experience and this is what Google and all other major search engines want to tackle. 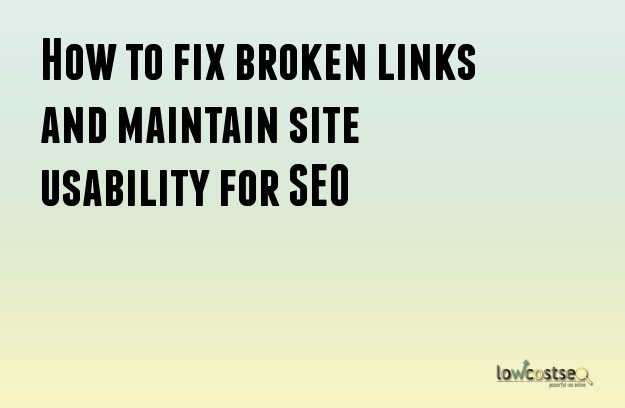 Search engines like Google make it clear that all webmasters must keep a lookout for all broken links and fix them as soon as you can. The main aim is to control the damage that broken links could have on your rankings and get the search engine spiders back crawling on the site too. All in all, all the webmasters, website owners need to monitor the activity on tools such as Google Analytics, Google Webmaster Tools or any other tools which will give a breakdown of any broken links that your site might have. To fix the broken internal link, simply just remove the link or amend it and point to a web page that does exist on your website. Ensure that you remove all the broken external links unless you have a relevant link that is ideal to replace it with. If you have any questions about fixing broken links do get in touch with us and we will assist you removing them and fixing them for you. Here is a great web tool to use in checking for Broken Links. The internet is an ever evolving landscape, so it goes without saying that things change all the time. This is something many an SEO agency has learned to deal with, but it can often be a difficult concept for website owners to handle. A key part of this is the nature of broken links. Sometimes, you redesign your website and some URLs get adjusted as a result. Sometimes, someone edits links incorrectly. What’s important is that fixing existing backlinks is just as important as generating new links. So, what can you do? First of all, you need to find these links. There are many tools available, such as Screaming Frog, which are great for this. You will need some sort of tool (even if its a free online one) as it is impossible to find broken links yourself, unless you want to go through every link that has ever been generated for you. This is something we recommend doing on a regular basis, whether its once a month or once a year. Similarly, it is also something you can look at if you notice a drop in traffic. It might be a number of important websites have broken the links, thus influencing your rankings. When numerous posts have the same broken link – one redirect is easier to set-up. When you can’t contact or get hold of the people responsible for the linking website. In all of these cases, a 301 redirect will help. Just make sure to redirect to a page that, where possible, matches the original intended destination. After all, if people do click the link, going to your homepage might not be what they had in mind. Likewise, if the links have anchor text, use this to your advantage with a fitting destination URL. However, sometimes it might not be worth fixing a link. If the website has a particularly low authority, you might want to link to it. Similarly, if a website already has numerous links to your website, the added value of one extra link quickly diminishes. The same can also be said for forums. You may come across broken links from 5 or 6 years ago. Does this forum delete old content at a certain point? Will the admin happily make the changes anyway? These are all questions you need to ask yourself. In time, this will let you instinctively and intuitively know which links to prioritise. Finally, keep a track of the changes you’ve made. This way, you can check to see when the redirects work. If you’re asking webmasters to change the link, this can let you know how quickly they do so.